The much-anticipated Indian Grand Prix began here Sunday with world champion Sebastian Vettel of Red Bull starting from the pole position at the swanky Buddh International Circuit. Force India drivers Adrian Sutil and Paul Di Resta began at 8th and 14th places respectively from the grid. 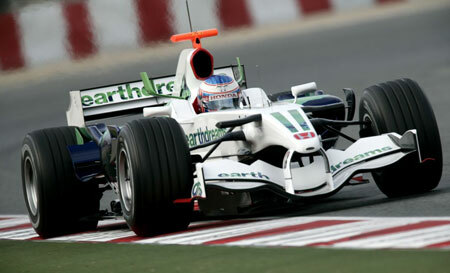 The only Indian driver in the race, Narain Karthikeyan of Hispania racing started at the penultimate 23rd position. B-town celebrities – from Bollywood Badshah Shah Rukh Khan to actress Priety Zinta — thronged the venue to watch the race live at the Buddh International Circuit. Celebrities took to microblogging site Twitter to express their excitement for the event. Shah Rukh Khan: Long flt great sleep. Got pleasantly hit by the Delhi winter start. refreshed..reloaded..ready to enjoy F.One and ‘Ra.One’ in my hometown i am ON. Preity Zinta: Driving to the Formula 1 Race! So excited….Cannot believe the crazy traffic and how hot it is! Bring on the speed boyz.. We are ready! Rahul Bose: Young F1 fans travelling to Delhi spotted a mile away. Ferrari t-shirts, shades, shorts…Foggy day in Delhi. Presume it will lift before long. Psyched for the race!